With some changes over the winter and missing the first 2 NMCA races due to weather, team BBNova was ready to get back out to the track. Thanks to some great parts by Dart, some modifications to our Hutch trans and converter by Hutch, and topped off with one of Prosystem’s new SV1 carburetors, we knew we were going to be competitive this season. It sure felt good to backed by the best companies in the racing business. With a few test sessions under our belt, we headed out to Reading, PA to see if any of the other NPS competitors had stepped up over the winter. We arrived at the track a little later than we had hoped for and missed the test session for the day. 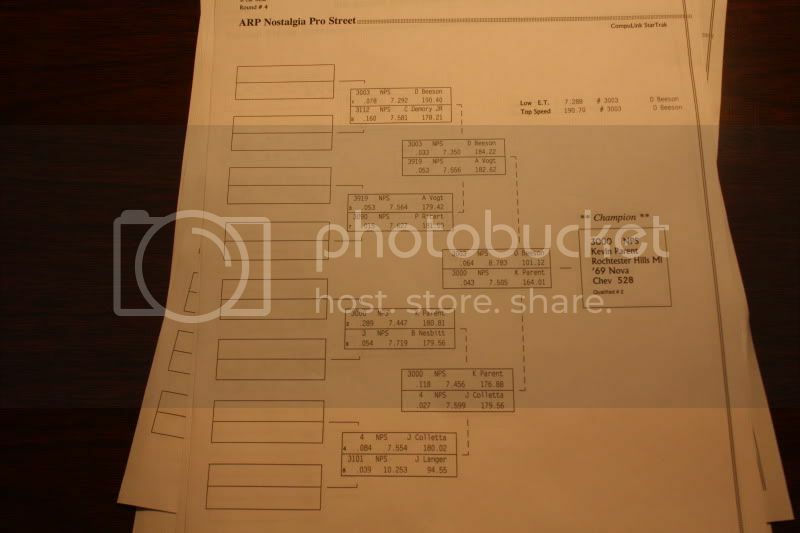 The NMCA had a little different schedule for Maple Grove as we had one qualifier Friday evening. After successfully passing tech, we prepared the car for that qualifier. BBNova’s regular Brian could not make this race but we were well equipped to handle the job. Chris, my brother took over the job as crew chief. He lead Bob, my uncle Alex and Duane. They did a great job preparing the car and keeping my mind where it needed to be. The call was made for our class so we towed up and got me strapped in the car. After the burnout my crew got me in tracks and up to the lights. I staged the car and let go of the “GO” button and the car left hard. I pulled the gears and got the car down the track. I lifted a little early as I knew nothing about the tuneup and didn’t want to hurt it. The car went a 7.63. This put us #4 for the day. We gathered all the data and put the car away for the night. We woke up Saturday morning and grabbed some breakfast. After filling our bellys, we headed to the track and unloaded everything. After discussing what we learned from yesterday, we made some changes and waited for the call for our second qualifier. The call was made and we knew we could improve on our first qualifier. After doing the burnout, I staged the car with some help from Chris and waited for the lights to drop. Once again I let go of the button and the car left hard, very hard. Seemed like forever before it sat the front end down just as I as pulling second gear. As I pulled second gear, I felt the front end start to rise. I knew the car was on a pass as the car rarely does this. It sat the front end down and charged down the track. Turned out it was a very good pass. It ran a 7.43 which put us from #4 to #2 as nobody else improved enough to stay #2. In between rounds Chris set up a barber shop to make some extra cash for team BBNova. We had one more qualifier for the day. The 3rd and final qualifier was unfruitful for most of the class. The qualifying was done and the ladder was set. We showed up at the track Sunday morning ready for racing. However, the weather forecast wasn’t looking like it was going to cooperate. They were calling for rain mid afternoon so racing was probably going to happen fast. We drew Barb Nesbitt first round. Barb cannot be taken lightly as she can cut down the tree and has a quick car. Barb and I did our burnouts and staged our cars. Just as the lights came down I got distracted and she put a huge holeshot on me, her astounding .054 to my .289 light. I had my work cut out for me if I was going to catch her. The car left hard and as I pulled the gears I was catching her. Luckily there was enough track as I came by her around the 1000’ mark. Margin of victory was only .037. We narrowly escaped that round with a win. That put us up against Jeff Colletta in the semis as Jeff took out John Langer 1st round. The call was made for the semis and the remaining cars towed up to the lanes. We had lane choice and chose the right lane as that seemed to be the better lane. Jeff and I staged the cars. The lights came down and Jeff left first with a .027 reaction time to my .118. So once again I had to hit my gear changes and hope we had enough to go around him. The car pulled strong and pulled out the win to put us in the finals against “Dangerous Dave Beeson”. Dave had been running as fast as 7.2’s over the weekend so we had our work cut out for us. As we were preparing the car, rain began to fall and out a hold on everything. This gave us some time to come up with a game plan. Do we let the air out of tires? Do we have a crew guy walk in front of his car? Do we swerve into his lane? All good plans but we thought we had better not. The rain stopped and the sun came out. The track was dry and we were ready to go at it for the final time. Dave and I towed up and got ready to do battle. It was a little like David and Goliath. Dave had been 2 tenths quicker than our quickest pass. I started my burnout and heard Dave doing his as he came by me. Not being able to see much around my hood scoop, Dave just disappeared. I thought where the hell did he go? I leaned way to the right to see around the scoop. Seems Dave way trying to sell t-shirts. He didn’t stop till half track. I started to back up and out of the corner of my eye I see purple coming back up the other lane going what seemed to be 100 mph. I guess he was up for this match. Chris got me up to the line and I staged the car. Dave bumped in and I followed him by final staging my car. Dave final staged and the lights came down, I put some tree on him. My .043 to his .064 reaction time. Dave was pulling on me as we drove down the track. He caught me and started pulling on me. All of a sudden the purple dropped out of sight. I couldn’t understand. I kept my composure and noticed him far behind. He must have hurt it. I lifted early to claim the victory. David just beat Goliath. Looked like all of our hard work and support over the winter had paid off. The parts from Dart had performed beautifully. The new Hutch trans and converter did just what he said they would do pass after pass. The Pro systems VH1 carb did exactly what it was supposed pass after pass making tons of repeatable power. Thanks to my crew chief, Chris. Thanks to the rest of my crew Duane Bob and Uncle Alex. You guys made the whole weekend possible. Thanks to Mike Galimi, Brian Free, and the NMCA for the photos.